Was going to fit the red wheel rim tape to my 1098. Bought some off ebay but it looks more like orange than the red I paid for. Does anyone know whare I could buy the Ducati red rim tape? I went to a local signs/graphics place and they cut 4 quadrants (16 in all) if that makes sense, sized to the diameter of the wheel. This made it very easy to fit them already being curved as opposed to trying to bend a straight line round the rim. There red which is pretty generic in signs/graphics is an almost perfect match for ducati red. Hi mate got a sample from my local sign/graphic place and it still looks orange. Thanks for your reply but still looking for Ducati Red wheel trim tape if anyone knows where to purchase it. I used it as number board outline on the race bike and it was about £1.99 for something like 10 metres! Comes in various widths too. Thanks Antonye, ill take my seat cowl into halfords to see the colour match. 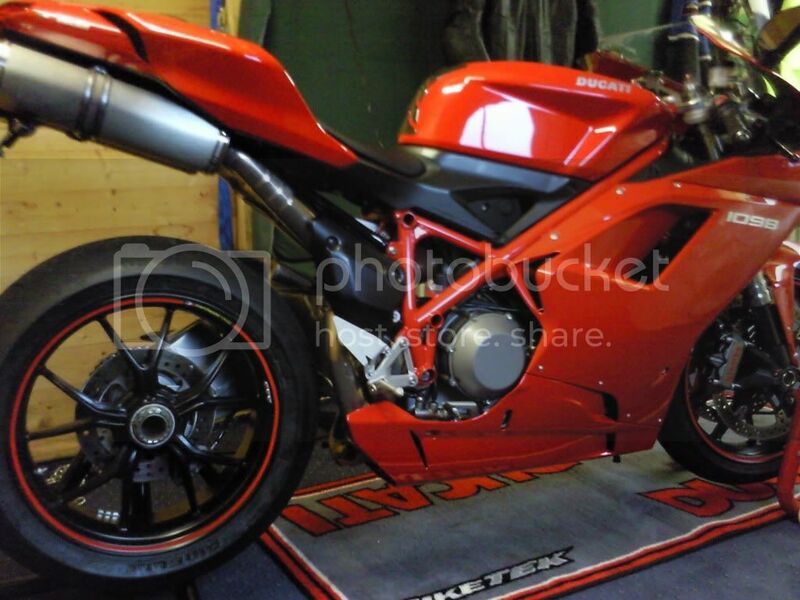 Well Antonye you were spot on the colour is the closest to Ducati Red as I have seen. Bought them this afternoon and fitted them in no time. Here is the link to Halfords for the wheel rim tape. Ah nice one, glad you got sorted! What you think? Rim tape fitted. They look exactly like my Hyper wheels with red stripe as standard! Hi Dougie, did you have a any problems in curving the tape around the mags? Or was it relatively easy to apply? Powered by vBulletin 3.5.4 - Copyright © 2000 - 2019, Jelsoft Enterprises Ltd. - © Ducati Sporting Club - All times are GMT +1. The time now is 09:18 PM.